Griz guard Ahmaad Rorie drives to the basket against two Michigan defenders during the NCAA tournament. It was an amazing season for the Montana men’s basketball team. The Griz finished with a 26-8 record, winning both the Big Sky Conference regular-season and tournament titles and advancing to the team’s first NCAA tournament since 2013. The 26 wins are the third-most in Montana history and featured historic achievements, including 13 consecutive victories, a 14-0 record at home and a school-record seven straight road wins. 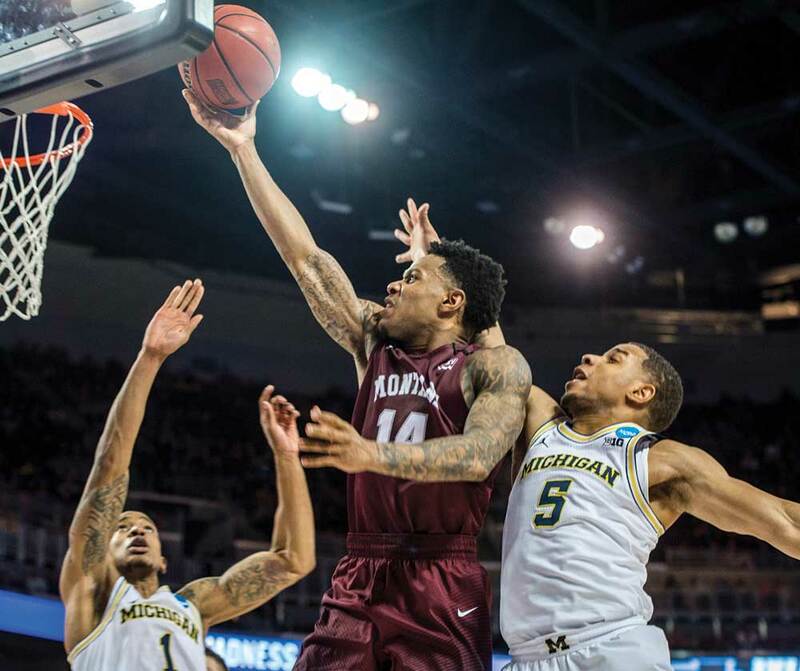 The wild ride ended March 16, when the Grizzlies fell to the seventh-ranked Michigan Wolverines, 61-47, in the first round of the NCAA tournament. As they did all year, the Griz played stellar defense – trailing by only 5 at the half – but they couldn’t muster enough offense to close out the game. The Wolverines went on to lose to eventual national champion Villanova, 62-79, in the title game. • Montana finished its home slate undefeated. It marked the first time in 26 seasons, and the fifth time ever, that the Grizzlies posted a perfect home record. • Montana set a school record with seven consecutive true road wins from Dec. 28 through Feb. 3. • It marked the fifth time in program history a Montana team has won both the regular-season championship and tournament title. • Montana was named to the NABC Team Academic Excellence Award for the second consecutive season (cumulative GPA above 3.0; 100 percent graduation rate). • The Grizzlies won their first 13 conference games. The winning streak was one game shy of tying a school record and was the third-longest active streak in the NCAA at the time. • On Dec. 30 and Jan. 4, Montana won back-to-back games by 30 points, marking the first time in 44 seasons Montana had accomplished that feat. The team's 13.3 margin-of-victory average during Big Sky play was the best in the league. • UM swept the season series against rival Montana State, pushing the series advantage in Montana's favor for the first time in the 117-year history of the rivalry (149-148).